I am a word guy: always have been, always will be. When I was studying for my licentiate in canon law, I noticed a widespread problem among my classmates, even (especially?) among those students who were most enthusiastic for the shift in translation of official liturgical texts toward a more stringent literalism: these students demonstrated a strong preference, or rather an almost insuperable urge, to produce “dynamically equivalent” translations of texts for class assignments. I cannot really fault them; once you begin to get the vocabulary, it is very tempting when scrabbling about laboriously for the word-for-word meaning of a passage to instead leap to the apparent safety of a sentence that sounds intuitively probable. The problem with this approach is fundamental: even when it is more successful than not (such as in a classroom setting with a patient instructor setting the course), it ensures that the nitty-gritty of the Latin mechanics — case and number for the nouns and adjectives; mood, tense, voice, person, et cetera for the verbs — are never grappled with. The grammar never gets a chance to make sense, to mean anything for the student. There is no shortcut to Latin literacy. The only way to grasp Latin is to get down in the mud with it, grab it by the tongue, and make it show you exactly what it is doing with each and every word, and why. This is why I try to stay literal as long as I possibly can, and sometimes even longer. Perdurante mortis periculo, commendatur ut sacra communio pluries, distinctis diebus, administretur. Danger of death perduring, it is recommended that holy communion be administered often, [but] separated by days. While the danger of death lasts, it is recommended that holy communion be administered often, but on separate days. but I think it no less so either. The complement of time in the ablative (distinctis diebus) comes off a bit obscure, because the Latin there is itself idiomatic; some compromise probably needs to be made for greater English clarity. But I do believe it extremely difficult to offer any supposed synonym that captures all of what perdurare means in English better than, well, the (English derivative of the) word itself. Words are words, and every translation, no mater how expert (or not) is not necessarily a betrayal as some have put it, but unquestionably an interpretation, a creative composition which is either more or less faithful to the sense of the original, but never absolutely completely so. As a canonist, especially as I am grappling with legislative texts — the very sort of texts Latin is so innately suited for — I will always prefer to take it word by painful word. Note: this post originally appeared in somewhat different form on this site on 14 February 2011. The case of the “Kennedy annulment” came up in class one day during my first year of canon law studies, and it started quite an extensive conversation. However, no one present had read the book written by the respondent in the case, so I took it upon myself to tackle it. I am so very glad I did. 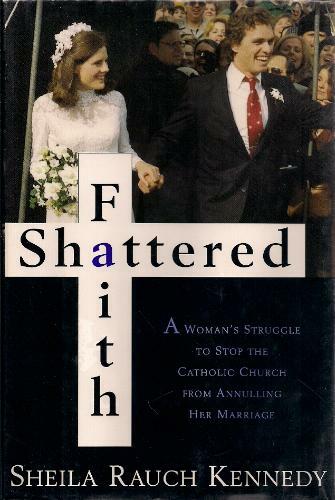 The book in question is Shattered Faith by Sheila Rauch Kennedy (New York, Pantheon Books, 1997). It was fascinating reading this book at the beginning of a career processing cases of nullity just like the cases that Kennedy grapples with in her book. I have approached this specific line of work, indeed feel called to it, precisely because I first came to see it as (at its best) a ministry of healing and reconciliation of persons with the Catholic Church. While my understanding of marriage nullity investigations has necessarily become much more complex in recent years, that sense of ministry perdures. It would be easy (if uncharitable) to pooh-pooh the several technical inaccuracies Kennedy makes throughout the book, but I had to remind myself that I was reading as an insider, from within the very circle of trained expertise which she is trying so valiantly to understand from the outside. Considering the approach she took, based on the sources she had available to her, I think it is very much to her credit that she was able to uncover as clear a picture of the so-called annulment process as she did. Kennedy takes the occasion of fighting her own fight to cast her net wider, to make hers not just a personal narrative but a work of research, albeit not in a scientific sense. She recounts the experiences of other women who have been the unwilling respondents in marriage nullity cases, and in telling her tale she is able to extend her narrative, and the import of her message, by weaving in the stories of others to build her case. Her thesis, of course, is that the ‘annulment machine’ in the American Catholic Church is out of control, and she is hardly the first person, inside the Church or out, to have made this claim: Popes John Paul II and Benedict XVI were quite clear in their repeated expressions of that same opinion. Another thing, small perhaps, but noticeable, is how carefully she avoids flopping the Kennedy name and family history around between the covers of this book. She writes from an assumption that readers will know who her former husband is, and largely leaves it at that, which I thought was a good way to go about it, even though I was reading this long after this was a news item, and so sometimes wished for a little more detail, but almost always for my own sense of historical-biographical context, not because it was anything truly germane to the plot of the book. I still absolutely believe that the work I am doing in the Church is worth doing, but this book broadened my perspective on the process and the impact — sometimes devastating — it can have on the lives of those involved. There are two parties to every marriage, and often children besides, and while the spouse bringing the petition for a declaration of nullity clearly wants to move on with his or her life and leave that relationship behind, that feeling may very well not be shared by the other party. So for me Kennedy’s story was a cautionary tale for me, and I hope it will inspire me to apply with particular care the Church’s own rules of justice, and not allow procedures to roll unquestioningly over people’s lives in the name of pastoral convenience for one of the parties. Pope Francis has certainly expressed concern over how the current procedural structures could be made better, and how the church might do more to assist those many Catholics who have divorced and re-married. I am quite ready to admit that the processes we have are not perfect, and I would welcome careful reform in this area. As things are currently structured, however, we must bear in mind that the work of the ecclesiastical tribunal is not, ultimately, about making anyone happy. It is not about “letting people get married again” in the Church. Those may sometimes be the results. But the purpose of the process is simple: to discover the truth, and to respect both parties throughout the course of that search for truth. I pray that I and my colleagues can always keep sight of that, and that in searching for and discovering the truth, all may find they are set free. This morning at Mass I heard the celebrant utter, for the last time that I will hear, the prayer “for Benedict our Pope.” In roughly forty-eight hours the 265th Pontificate will come to a scheduled end, something barely thinkable until Benedict XVI announced his resignation a few weeks ago. How excited I was to hear those words! I held my infant son in my arms, standing excitedly before the television, watching that upper window with the rest of the world to see who would emerge as the Successor of the Prince of the Apostles. I caught myself on the verge of sobbing several times, so intense was the anticipation. And when Benedict XVI finally emerged into view I dropped to my knees in my living room, trembling with religious excitement. And now my son is an infant no longer, in either the colloquial or the canonical sense of the word, and a new conclave will begin next month. In the years of this papacy I have gone from being a sullen seminary refugee, attending Sunday Mass each week out of a deep-rooted sense of obligation and little more, to a licensed canonist fresh out of graduate school, working full time for the Church directing two diocesan offices. Hard to imagine a much more dramatic move from fringe to core than I have traversed these past few years in the Church. And will I drop to my knees when the next Pope is revealed? I don’t know, probably not: my knees aren’t getting any younger, and I have a lot of steps and hills to climb these days. But I will certainly be prayerfully excited, and ready to continue my journey, in the Church and with the Church, toward our shared goal of life everlasting. There are many, many questions flying through the ether following Pope Benedict XVI’a stunning announcement that he will be resigning the Petrine Office effective 28 February 2012. And yet, as at least one of my colleagues has already pointed out, most of them are pretty trivial, maybe because most of the substantive questions are already answered for those who care. And one of the most persistent questions I see is also arguably the most trivial: the question of title. What will we call a retired Pope? For Catholics, at least for the more traditionally-minded of our tribe, protocol and formality is a BIG deal. If you need convincing, just consider the mere existence, let alone the success, of James-Charles Noonan, Jr.’s book The Church Visible: The Ceremonial Life and Protocol of the Roman Catholic Church (Viking, 1996; a revised second edition came out in 2012 from Sterling). Titles, choir dress, table setting: it’s all in there, and in some contexts it probably is important to know. But I digress; back to the subject at hand. Dr. Ed Peters argues well that Benedict XVI will return to the status of a cardinal, albeit a superannuated one, too old to vote in future conclaves even if he wanted to (which he has already made clear he does not intend to do). This makes good sense on a practical level: cardinals enjoy a long list of universal faculties, meaning they are independent of the jurisdiction of any diocesan bishop (save that of the Bishop of Rome). As Peters correctly asks, “Could we really imagine the alternative: a former pope being subjected to the jurisdiction of someone other than the next pope?” It is a rhetorical question, for surely we cannot. Personally, I suspect we probably won’t have much need to call him anything. All signs indicate that once the dust settles and the next Bishop of Rome is duly elected, the man who has been Benedict XVI for nearly eight years is going to step into a quiet, prayerful seclusion from which he will rarely, if ever, emerge in this life. He has carried a great burden, and we should know him well enough to realize that, if he is laying it down as he is, then he must be truly worn down indeed. He is not going to strike out on the lecture circuit or do a book tour: he is going to pray, quietly, out of public view, and prepare for his final task: eternity. On most weekdays I wake up well before the rest of my family, and one of the first things I do is wake up the iMac and check my news feeds in the quiet of the pre-dawn. (I really should move “pray” to the head of my morning activity list; that is something I am actively working on.) Most days this is little more than a stalling tactic before I tackle the dishes and my own ablutions. Not much has typically happened in Facebook Land between my late bedtime and my 6am rising. But today was exceptional in almost every way. Post after post after post from my early-rising Catholic friends carried the same news: Pope Benedict XVI had just announced that he will be resigning his office as Bishop of Rome effective 28 February 2013, just a little more than two weeks hence. Obviously my historical details were a tad off (it was pre-coffee, after all), but even so, I stand by the sentiment. This is stop the presses sort of news, and at least a few news sites and blogs have crashed under the surge of traffic this morning. Distinguished canon law expert Msgr. David-Maria Jaeger, OFM rightly refers to the details of this move as “uncharted waters”. The law of the Church, while acknowledging the possibility of such an event (canon 332 §2), makes no further provision or prescriptions for the details of such a heretofore theoretical eventuality. It will mostly take patience on all our parts to see how all of this shakes out, both canonically and (arguably more importantly) theologically; patience and faith. As someone who has a blog – and who therefore aspires to the title of “blogger” – probably the greatest pressure I feel is the pressure to be timely. A news item relevant to my scope of interest pops up, I read it carefully and type up a brief (or not so brief) reaction-response, and click “Publish” – that is how blogging is supposed to work, right? I don’t know, actually. First off, I am immediately suspicion of any inkling that an activity is supposed to be carried out in a certain manner. Not that I fancy myself a great non-conformist by any stretch, nor that I think we should question everything, mistrustful of any pretense of received wisdom or external authority. Far from it. But I do think we too often hamstring ourselves by locking into a convention of one sort or another, and then failing to notice that, when that convention limits us in some way, we just shrug and say, “Well, that’s the way it is.” But perhaps I digress. Anyway, I have kept trying to work that way as a blogger, and it just has never worked for me. In a word, I think I am slow. I just do not process things quickly enough to pull off the turnaround necessary to push out a “current” post on a hot topic. Notice I say “do not” rather than “cannot” on this point. I don’t believe hat I am particularly broken or flawed in this regard. I just don’t do it. Could I? Maybe. But I am beginning to wonder if perhaps it is a mistake to keep trying. The world has plenty of speedy commentators, many of them very, very capable. I am not them. Instead, I am me. I ponder things, usually for far too long. Sometimes, this pondering eventually crystallizes into some more-or-less cogent prose. When that happens, I post it. And when it does not, I post nothing. Rather that fight against that, I am inclined to embrace my ruminative process, and not try to hitch my words to any news cycle. Not that I won’t find inspiration in things I read about. But I just won’t feel bad that those things are no longer news in any sense by the time I write something about them. And who knows: maybe if I stop being disappointed in how slow I am writing, I’ll be more energetic and start thinking (and therefore writing) faster. It’s worth a try. Now, I have to admit, there was a time when I was highly sympathetic to the traditionalist cause. The liturgy of my childhood was certainly not the liturgy of my parents’ childhood, and for a deeply romantic lad steeped in a love of all things past, that was a painful reality. I gazed at pictures of old vestments and altars and longed to worship as my ancestors had done. I wondered what could possibly have gone wrong to change so much so fast, and talk of “the smoke of Satan entering the Church” was frequently heard in our social circles. But much has changed in my life, and I have changed apace. That is a long story to go into, but suffice it to say for the moment that now, when I read a tweet like that above, I am just sad. Sad for people who would rather believe in a vast demonic conspiracy and a train of anti-popes than open themselves to the possibility of change. Sad that the Body of Christ is continually riven into such petulant warring factions. Sad that we cannot all be working together to worship and glorify the God we all love, and who died for all of us. Schism makes me sad, and most days I can only pray that God will help me find some shred of hope to hang onto in this regard, for it is so tempting to despair that the dream ut unam sint will ever become a reality.